Seeedstudio’s RDM630 and the RDM6300 are two different types of RFID readers, even though they often get mixed up. Besides the similar names, another reason for the confusion might be that they share the same pin layout and transfer protocol. According to my knowledge, besides the same technical functionality, they have nothing else in common (like same manufacturer, predecessor/successor version, etc.). 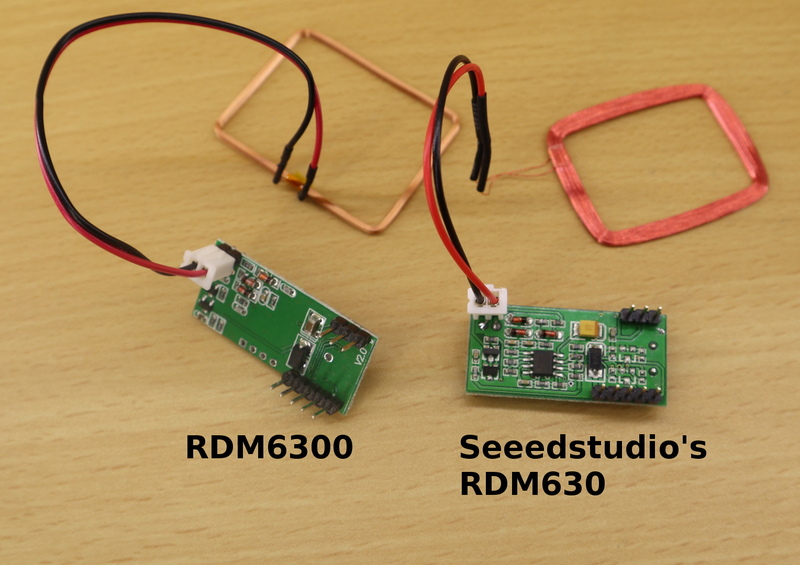 Usually, you should be able to purchase Seeedstudio’s RDM630 for about 10-15$ and the RDM6300 for about 1-3$. In my opinion, the price difference can be easily justified as the RDM630 is more robust and allows much higher reading distances. Both readers work at a frequency of 125 kHz and enable to read EM4100-compatible tags. Other tags (for example EM4305 tags) do not (or might not) work with these readers. 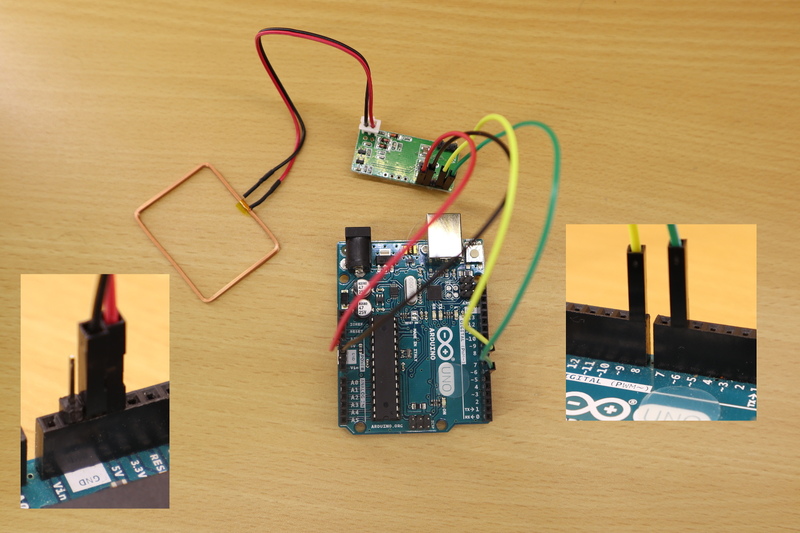 In this tutorial, I demonstrate how to use the RDM6300 and the RDM630 with an Arduino Uno. Luckily, both RFID readers use the same protocol via a serial connection. As a result, the same source code can be used to make both readers work. Therefore, regardless of whether you own an RDM630 or RDM6300, this tutorial should be of use to you if you want to make it work with an Arduino. * If you are looking for an RDM630, please keep in mind that many offers are wrongly labeled. You can find many products that are advertised as “RDM630”, although they are of type RDM6300. Therefore, take a close look at the pictures. Pin layout of the RDM630. The RDM6300 has the exact same pin layout. In total, the RDM630/RDM6300 has 9 pins, where Vcc and GND exist two times. 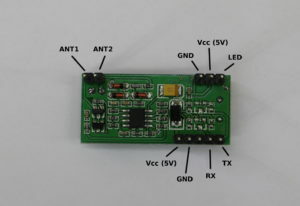 The Vcc pin must be connected to a 5V DC. ANT1 and ANT2 are used to connect an antenna to the board. Typically, the RDM630 as well as the RDM6300 already come with an antenna. Nonetheless, it is possible to switch the antenna, for example to a custom-made antenna. TX is used to transmit data and RX is used to retrieve data. 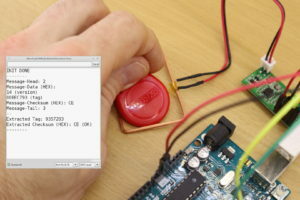 The LED pin can be used to quickly lookup whether an RFID tag was successfully read. If RFID tag is not present, the LED pin is at 5V (HIGH). If an RFID was read, the LED pin goes to 0V (LOW) for some moments (yes, it goes from HIGH to LOW!). Wiring between an Arduino Uno and a RDM6300. The same wiring can be applied to an RDM630. In this tutorial, four pins of the RDM630/RDM6300 are wired to the Arduino Uno. 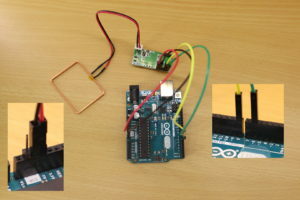 Vcc has to be connected to the Arduino’s 5V pin (red wire) and GND to the Arduino’s GND (black wire). The TX pin has to be connected to digital pin #6 (green wire). Basically, the RX pin is not required as we do not send data to the RFID module in this tutorial. For the sake of completeness, RX is connected to digital pin #8 (yellow wire). Lastly, the antenna is connected to ANT1 and ANT2 (polarity does not matter). As mentioned before, the same source code can be used with both models (I tested the code with both models). Basically, when an RFID tag was detected the RDM630/RDM6300 sends a frame with 14 bytes: head [1 byte], data [10 byte], checksum [2 byte], and tail [1 byte]. The head (or preamble) is always 0x02. Similarly, the tail is always 0x03. The data field contains ASCII-encoded HEX values. Sometimes, manufacturers tend to split the RFID tag data field into two parts: version and tag. Therefore, depending on your RFID tag type, the first two bytes of data might be the version and the other 8 bytes the actual RFID tag. I considered this in my source code. In order to calculate the checksum from the data field, one has to perform an XOR-operation over all data entries. Serial.print(" (OK)"); // calculated checksum corresponds to transmitted checksum! This entry was posted in Development on January 5, 2018 by mschoeffler.